Opportunity Mars rover is surveying the scene of discarded entry heat-shield hardware scattered across Meridiani Planum landing site. NASA's Opportunity Mars Exploration Rover is wheeling about a field of spacecraft litter -- the remains of heat shield hardware that protected the robot from its plunge through the martian atmosphere last January. The heat shield was shed during Opportunity's descent and landing sequence, falling several miles to the surface. Space engineers are eager to study the clutter for clues as to how well the heat shield survived its fiery entry. Scientists hope to glean useful data about Mars' soil, given the entry shield's high-speed impact. The Mars Exploration Rover (MER) survey of spent entry equipment includes looking for any surface disturbance produced when the hardware slammed into the terrain. An entry shield-created crater might give an idea of the mechanical properties of the soil on Mars, said Benton Clark, Chief Scientist of Space Exploration Systems at Lockheed Martin Space Systems in Denver, Colorado. Clark, a MER science team member, said that such a crater could help identify and "calibrate" other small craters that the rover comes across. 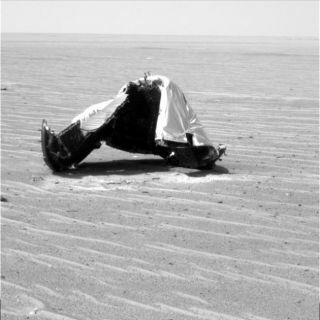 The heat shield hit hard after it was intentionally dropped off while the Opportunity rover and other landing gear were still on a parachute. "One of the reasons the scientists are interested in inspecting the area is that they are hoping that when the heat shield hit the ground, after free-falling, it would create a small, fresh crater that we could inspect," Clark told SPACE.com. On images relayed from Opportunity, there appears to be the impact or a bounce location to the far right of the heat shield, Clark noted.